Slinky was the rat that stole my heart. There were other great rats, don't get me wrong, but Slinky just ripped my heart out and stashed it under my bed for safe keeping. I wish I could describe him to you - what made him so special. I'll try, but I don't think there's any way humanly possible to capture his spirit. Only a rat could truly do that, I suspect. As a child, Slinky was a little brat. 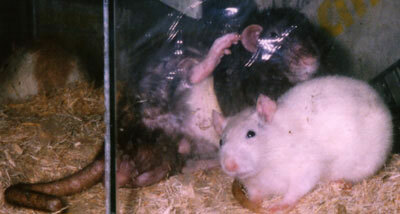 At the time, I was already hooked on rats. 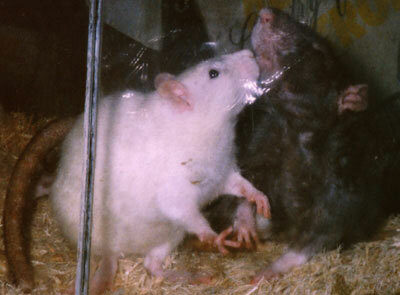 LJB and Rattus, Freud and Skinner...they all told me that rats were the best friends to have. But I wanted more...I couldn't get enough...and I really, really, really, wanted Rex rats. We searched high and low and ultimately ran into a Herp shop that had a whole litter of them. I couldn't choose so I took them all (except one because I thought she was sick but we went back for her). I guess you could call these guys the first FanClub but I didn't know it at the time. 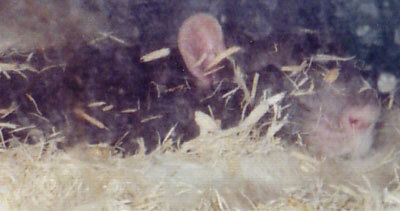 So we've got this entire litter of furballs - they were the youngest rats we'd ever had. We were hooked. We lined up a bunch of aquariums and let the boys have the whole wall. We introduced the two girls to our existing girls. Slinky was nothing special. In all reality I was totally mesmerized by Buddy - he was so soft and looked like a thick pile carpet. A lot of the other guys looked mangy and one was downright nasty. I think, in the beginning, I confused this guy with Slinks so I tended to avoid him. Buddy was very sick. Actually, most of them were but I didn't know it. Buddy and one of his sisters (not the one that looked sick - she was just a patchwork hairless) passed away soon after we got them. So anyway, there's a pile of mangy rats in our living room. One guy, Grandpa, was kind of funny. I spent a lot of time with him, watching him... But they were growing up, and one guy was just a pain in the pootootie. He had no concept of gravity. He had no idea that his home of aquariums was 5 feet off the floor. And he didn't care. 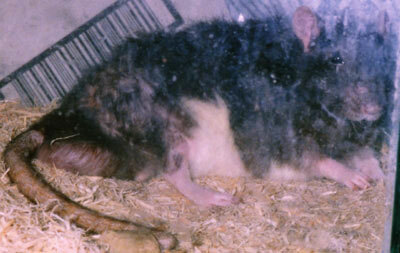 He was our first escape artist, the rat the rest followed. He was Slinky. I was so angry with him. I'd put him back and he'd hop right back out. He'd do it in front of my face or right after I'd turn around. If I didn't see him hop off, he'd follow me. He mocked me constantly. He made me insane. I ultimately closed the lid on his aquarium, leaving him with Grandpa, because he was making me so angry. He chewed his way out. I duct taped it. He found another way out. I gave up. He was our free ranger. I guess the reason for my giving in had a lot to do with his persistence. He wanted to be with me so why was I trying so hard to prevent this? He followed me around everywhere. He waited by the door for me to come home. He stayed up with me while I was doing my school work. He would climb up my legs if I didn't pay attention to him. He would climb up my legs if we were eating - how rude of me not to invite him to dinner! Ultimately we just plopped him on the dinner table. He would grab something, run down my leg, hop off to somewhere (later found this "somewhere" was under my bed), returned, grabbed something else, repeat, repeat, repeat. You couldn't eat fast enough. He had this walk...it was so weird. He kind of slithered. His fur draped around him like a skirt. Well, he Slinked...thus the name. I took him for walks around campus....without a leash. He never left my side (though sometimes we'd have to break for bush inspections). He slept on me...on my face...in my hair...and he never once peed on me. He destroyed only my best clothing...I've kept them all. He insisted on drinking Pepsi out of a can and when that failed (and it always did) he'd pry it out of my mouth. I'd intentionally leave dribbles on the can just for him (but it was never enough). He was the first to groom me when I was causing him pain (in an attempt to remove the greenest, ugliest abscess we'd ever seen). I really loved that little brat. When he died I was so lost (so lost, in fact, that it took me 5 years to get around to writing this). That squishy belly of his was off to greater things. This is Slinky napping, apparently. I loved the way he curled his nose like that. There's more nose-curling down below as well. By the way, in case you're wondering, yes, his tail is short. 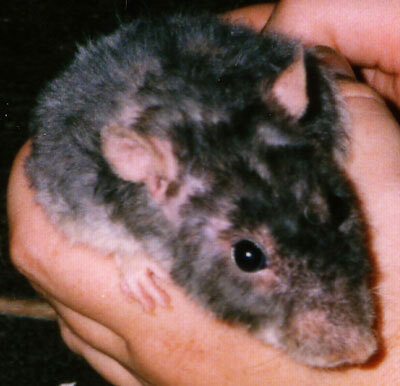 Though Slinky was one of the manliest man-rats we knew (he was the first to tail-flap - we thought it was "cute" - we had no idea) he had no alpha tendencies. He wanted to rule only one domain: Himself. Others, however, I think smelled his manly wiles and would approach him as if he were likely to attack - guys he knew! Anyway, once he turned the wrong direction, got nailed on the tippy tip of his tail, and it got really infected....so it got snipped off. 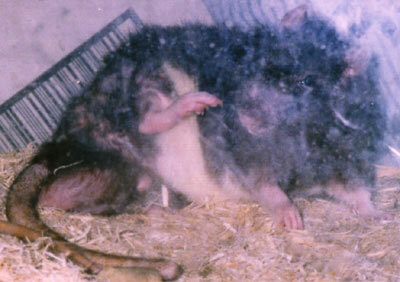 But that was OK, he was still the most beautiful rat we'd ever had.